Are you ready to get cozy in your favorite reading spot, surrounded by books while you sip your favorite beverage? I know I am! While you are spending those hours in literary bliss, why not double the fun with a little cover scavenger hunt? There is a list of items to keep an eye out for below. You may use one cover for multiple items. 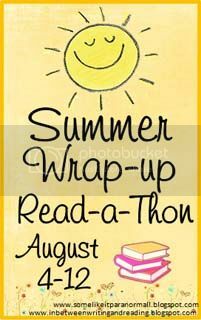 This challenge runs for the duration of the RAT so you will have a chance to not only find the items on the books you read, but also on the books other Summer Wrap-Up RAT participants are reading. Make a post showing us the covers with the items you have found (you don’t need to find them all) and link it in the comments section of this post! This can be done anytime during the RAT. A winner will be chosen randomly through Rafflecopter, so don’t forget to register yourself through the widget! Must be a participant of the RAT, be registered through the Raffelcopter, and have your post linked up in the comments section before the end of the RAT; 11:59pm August 12th. Hahaha, yes just keep looking! Thanks for joining in the fun! Well, I sucked it up and went looking…so I am finished! Thanks for a fun challenge!